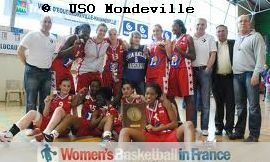 USO Mondeville will have a LFB team roster of 8 professionals and 3 players from the youth academy. Hervé Coudray, the head coach, has been given a new contract for two years and will be joined on the bench by a new assistant Romain Lhermitte who replaces Yves Tekpli. K. B. Sharp and Touty Gandega are the only players coming back when the new seasons starts. Lithuanian international Egle Sulciute is coming to play in France after a tough season with Real Club Celta Vigo in the Spanish league. She will be joined by her international team mate Giedre Paugait who played for VICI Aistes Kaunas. Naignouma Coulibaly will return to the Ligue Féminine de Basket after two seasons with Pleyber-Christ. Coulibaly played six games for Basket Landes during the 2008-2009 season but was released because of health issues. French youth international Kadidia Minte also comes from a club from LF2, Rennes, for her first experience in the LFB. Laëtitia Kamba and Ingrid Tanqueray complete the list of new players. For Tanqueray, she is returning to the club after two seasons playing for Villeneuve d'Ascq while Kamba comes from Union Hainaut Basket-Saint Amand. The remaining three players to make up the first team roster will come from the club's basketball academy: Marie-Bernadette M'Buyamba, Awa Sissoko and Margaux Touraud will continue to play with the Espoir team while continuing their basketball development with Coudray. All the players and coaching staff are expected to start the preparation for the 2011-2012 season on 18 August 2011.